Big race kites, which are fast and have a big wind range aren‘t generally the best for handling or jumping. These kites need at least five struts and need to be light, the Juice delivers a different robust but lightweight construction on only three struts even in these big sizes. conditions! The Juice combines the best out of many worlds: handling like a proper small 3 strut kite, upwind and light wind performance like a race kite. This light wind revolution is based roughly on a 3-strut arc, strut count, profile and outline, but the aspect ratio has been stretched from 4.5 to 5.3, and the leading edge diameter has been shrunk. The center strut is conventional - so as to improve overall stability. The result is a every day fun kite for the light wind days you´ve always been waiting for this some more knots to pick up. Now you´ve got the alternative! If you lack some juice – the Juice is the right choice! The Juice is playful, fast for its size, has a good depower and is user friendly in a wide wind range. This user friendly character of the Juice is the most important difference between the North Juice 18m and North Dyno 17m. Last couple of years we noticed great development in light wind kites. They have become a real addition to your kite quiver. So there I was on the water with 6 to 10 knots wind, a huge twin tip and only foils on the water. The next day everybody was out with 9/10 and 12 m2, and I could still survive with the Juice 18m2 and talk with some friends on the beach while positioning the kite at 12 o clock. The Juice felt stable but still reacted quitte well on steering input. Its just a bit too big for big airtime 'cause it doesn't shoot you off, but you'll still have plenty of seconds up in the air on a lower altitude. Resume: The Juice is a very loose and playful 18m2 up in the market. Easy pull and ride, great upwind, and a true free ride characteristics makes the kite a valuable light wind kite for those days you'll normally spent on the beach. Sometimes you leave the comfort zone for the best outcomes. So I did. Tested the new Juice in gusty 12 - 18 knots side off shore wind. 27m lines and flat water. Wax on my board tips and rail, ready for some big air, old school session. The water was flat and soft as butter, the wind hard and very gusty. The kite ... steady! Easy to ride. It took my some long arms in the big gusts, but never lost control. The lift and power building stayed gradual. Sheet and go on the right gusty moments and all the time in the world. Once airborne you turn the Juice a bit to its landing side to get the best glide, otherwise it will shorten your glide. The Juice likes to slide to the edge of the wind window. Great for upwind, acceleration and high-end. But not for gliding, you need some 'old school' flying skills. In the strong gusts the tips became a bit restless and a bit flutter of the canopy. Than you know. This is the endpoint of the 18m Juice. After 2 sessions of testing the Juice 18m in very light and very strong winds. I am impressed by its performance. Really well balanced kite. Low end its always the foils who win (6 knots), but the playful performance stays with the tubes ( above 8 knots). 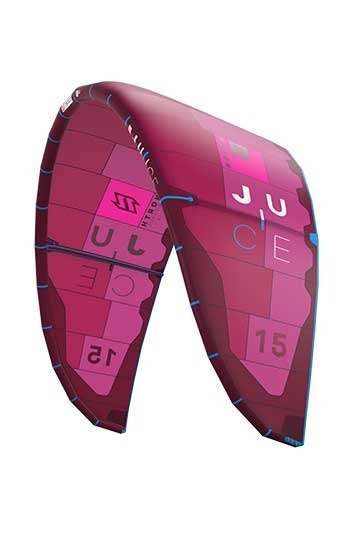 The Juice is one example of a playful light wind kite with a very big wind range. One of the best I tested so far! How does it relaunch in deep water and without board on the buttom end of the windrange?